A test of the AI system, called Scheherazade IF (Interactive Fiction) -- a reference to the fabled Arabic queen and storyteller – showed that it can achieve near human-level authoring. “When enough data is available and that data sufficiently covers all aspects of the game experience, the system was able to meet or come close to meeting human performance in creating a playable story,” says Riedl. The researchers evaluated the AI system by measuring the number of “commonsense” errors (e.g. scenes out of sequence) found by players, as well as players’ subjective experiences for things such as enjoyment and coherence of story. Three test groups played through two interactive stories – a bank robbery and a date to the movies – in order to measure performance of three narrative generators: the AI story generator, a human-programmed generator or a random story generator. For the bank robbery story, the AI system performed identically to the human-programmed generator in terms of errors reported by players, with a median of three each. The random generator produced a median of 12.5 errors reported. For the movie date scenario, the median values of errors reported were three (human), five (AI) and 15 (random). This shows the AI system performing at 83.3 percent of the human-programmed generator. As for the play experience itself, the human and AI generators compared favorably for coherence, player involvement, enjoyment and story recognition. The creators say that they are seeking to inject more creative scenarios into the system. Right now, the AI plays it safe with the crowdsourced content, producing what one might expect in different genres. But opportunities exist to train Scheherazade (just like its namesake implies) to surprise and immerse those in future interactive experiences. The impact of this research can support not only online storytelling for entertainment, but also digital storytelling used in online course education or corporate training. 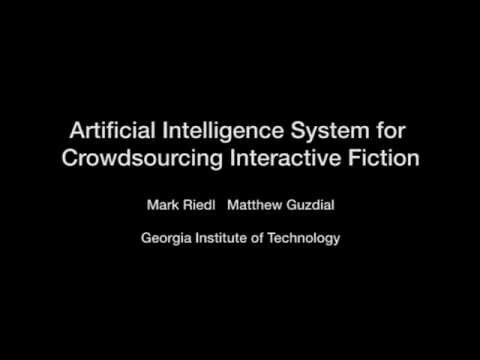 The research paper “Crowdsourcing Open Interactive Narrative” (co-authored by Matthew Guzdial, Brent Harrison, Boyang Li and Mark Riedl) was presented at the 2015 Foundations of Digital Games Conference in Pacific Grove, Calif. This research was supported by the National Science Foundation (NSF) under grant 1350339. Any conclusions expressed are those of the principal investigator and may not necessarily represent the official views of the NSF.